On Saturday, public libraries across Connecticut will be celebrating the eight annual Take Your Child to the Library Day with free events, activities, and treats for children and their families. Take Your Child to the Library Day was launched in 2012 in Connecticut, thanks to Nadine Lipman, children’s librarian at Waterford Public Library. Her goal was to motivate families and children to experience everything their local library has to offer including events, free enrichment programs, educational activities, numerous resources and to introduce children to reading. The library day has gone national and international, with nearly 1,200 libraries participating in 49 U.S. states and five countries. 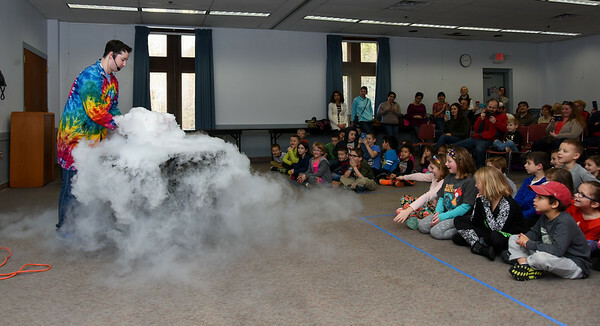 Last year, according to the Connecticut Library Consortium, nearly every town in Connecticut featured free family activities. nNew Britain Public Library will offer family crafts and simple group experiments at stations throughout the library’s children’s department between 10 a.m. and 4 p.m. At 2 p.m., the library will hold a special all-ages storytime, followed by a free raffle for tickets to the Feb. 19 musical production of “Charlie and the Chocolate Factory,” at the Bushnell Theater in Hartford. Families hoping to obtain free tickets can begin entering the drawing immediately. By visiting the library, checking out materials, or attending any of the library’s programs scheduled between now and Feb. 2, the chances of families winning tickets can increase significantly. Every library visit is another opportunity to enter the raffle. nBerlin-Peck Memorial Library will hold a library-wide scavenger hunt as part of their festivities which will run from 11 a.m. to 2 p.m. The children’s librarians look forward tp turning the department into a beautiful garden with handcrafted 3-D flowers that participating families will make during craft time. In addition, the Berlin-Peck children’s librarians will be distributing free gift bags to anyone who renews or registers for a library card. nPlainville Public Library invites families to stop in at 1 p.m. for a themed party inspired by the children’s classic, “If You Give a Mouse a Cookie.” Party activities include a special reading of the best-selling story, themed refreshments and activities, and a surprise visit from the book’s famous cookie-craving mouse himself. nSouthington Public Library will hold an arctic-themed story time, beginning at 10 a.m., followed by a free “Build-Your-Own Stuffed Animal” program featuring animals such as penguins, wolves, polar bears and spotted leopards. Supplies are limited, however, so to ensure that your child returns home with a cuddly, new arctic pal, please register in person at the library as far in advance as possible. Call 860-628-0947. Posted in New Britain Herald, Berlin, New Britain, Plainville, Southington Herald on Wednesday, 30 January 2019 20:15. Updated: Wednesday, 30 January 2019 20:18.